The annual argument about ‘real’ trees versus ‘fake’ trees is upon us. Proponents of ‘real’ trees talk about the smell, the uniqueness of a different tree every year and so on. Proponents of artificial trees point to the costs of buying a tree each year, the mess of pine needles, etc. As far as can be known the arguments don’t change much from year to year. The best arguments both for and against ‘real’ trees can best be understood by watching the hilarious National Lampoon’s Christmas Vacation and Clark Griswold’s search for the perfect tree. All I know is that I love all Christmas trees, even the hideous shiny aluminum trees with the rotating lights and the ‘flocked’ trees that were all the rage when I was in elementary school in the 60s. Plastic or real, Scotch pine or spruce, I love them all. Five years ago I required emergency surgery and came closer to death than I realized at the time. For three weeks it was all I could do to make it a few feet from our bed to my chair each day. I dozed in my chair all day doing little but taking pain medication and gazing at my tree. At a time when I did not have enough energy to read, watch TV or even pray the soft glow of the lights on the tree gave me a sense of peace, stability and hope that things would be better in the days to come. A few weeks after the surgery I used a wheelchair to get on a plane to Germany for a promised Christmas with my son. Jet lag, continued pain and fatigue all combined to disrupt my sleep pattern so I spent many nights downstairs in his chair looking at his tree which was different and yet the same as my own. Two years after the emergency surgery, almost to the day, I had a knee replaced and found myself confined to my chair or my couch most of the time, even for sleeping. Once more I was dozing, immobile, and in pain most of the time. Once again I found comfort in the soft glow of the tree lights penetrating the darkness and experiencing a sense of hope that all would be well down the road. This year there seems to be an even greater awareness that evil is real and present in the world. Extreme violence and desperation are evident every day if one listens to the news or picks up a paper. Still, I wonder if the the world of Judea and Galilee was all that much different two thousand years ago. Poverty, violence and despair have always been present in the world and I will not see an end to them in my lifetime. But into that darkness came a great Light that has brought comfort and hope to millions upon millions for thousands of years. For some a Christmas tree might be a ‘pagan symbol’ or need to be ‘real’ to be any good. My Christmas tree is a very real reminder that I always seem to need this time of year; a symbol of hope in the darkness and evidence that all the darkness in the world cannot put out the light of a single candle. Wow! My hands are small for a man but they are not small enough to “write a message in a bottle” so this prompt is a tough one. How much could you even write, and who could read it? Instead of getting out a blue pencil to edit this prompt or to write a nasty letter to the editor who approved the prompt I will try to write about what I think was the intended prompt. These lines startled me the first time I heard them. I am so sensitized by the rituals of my faith tradition that the words “make a perfect offering” are impossible to eradicate from my memory. We always talk about the “perfect offering”… Leaving aside the theology for a moment I had to wonder for a moment if a world so obviously imperfect could ever offer anything that was perfect, or even if it was healthy to try. We are conditioned to say “I am not perfect, nobody is” but do we really believe it? Don’t we secretly always imagine ourselves, and others, progressing, or capable of progressing to something better than we are at the moment? We can say ‘accept them for who they are” but do we really mean it or would be prefer that what ‘they’ brought to us was a bit more perfect? How much unhappiness has been experienced by those of us who cannot not live with ourselves or the offerings we are able to make? I wonder if accepting imperfection is a path to compassion and mercy? “Ring the bells that still can ring,” is an easier idea to comprehend. I am old enough and battered enough to admit that all of the bells I could once ring are not available to me and never will be again. In time, all of my bells will be silenced so doing what I still can do, no more and no less, is an idea that appeals to me. I have never had a problem identifying the ‘cracks’ in the world, or in myself. I have had a bigger problem accepting them in myself, others, and in the general state of the world. Maybe one of the bells I can still ring involves developing more compassion and acceptance of myself and others? And the line “that’s how the light gets in”? I find that line tremendously comforting. It is comforting because I know that if I was capable of making the perfect offering, I would be not be in need of light or more properly, “the Light” and that seems an impossibility. These three lines that would be my message in a bottle would be another way of saying “Quit trying to be perfect, it’s impossible. Accepting yourself and others, cracks and all, is your only chance to walk in light”. Who would I like to find and read such a message? That’s easy. All of us, all of us….. I Don’t Know What to Write About…. I don’t know how often I heard the words in the title when I was a full-time teacher. I never had any problem finding words; quite the contrary. I have trouble limiting myself because I am always ready with a response, at least I was until I retired. I imagined that I would write all of the time about countless interesting topics but much of my writing was fueled by anger at my workplace. Admittedly, I still feel some anger towards that den of ineptness and iniquity but it is not so pressing nor so interesting to write about, why should I even bother? They say to ‘write about what you know” , and I don’t find that helpful. I cannot bring myself to write about the most moving, or the most terrifying times of my life. I have tried but words fail to convey the horror or the sense of wonder of those times of highs and lows. I bought a book of writing prompts suitable (?) for use with writing students and I am going to try to write ‘on demand’ about the prompts as they appear in the book. I can already see that some of them might make for some discomfort but my reading audience is limited to the fingers (no thumbs) of one hand so I will try to take my audience into consideration as any good author should. If I come up with any other good ideas perhaps I will write about those too…..
Of Poems and Prayers and Promises…. John Denver once sang a song about ‘poems and promises and things that we believe in…’ and I am not afraid to admit I liked the song a great deal. It spoke to me of love, companionship and contentment and for some reason the refrain keeps coming to mind lately. Perhaps this is the time of life for me to re-examine the prayers I have prayed, and the promises I have made while I still have some time. It might be that I finally have enough life experience to simply enjoy poetry for its’ own sake. A few weeks ago I was writing poetry, or prose poetry, as part of a retreat at St. John’s University in Minnesota. One of our mentors for the project is a retired theology professor and a published poet. He provided us with a selection of poems he had chosen either because they spoke to him, or because he thought they would speak to us as we struggled for inspiration. Not until I listened to the others discussing the poems did I realize how much I miss talking about literature, and I do not mean in some high brow way. No, I miss talking about a well-turned phrase, an unexpected metaphor or an unlikely simile. I miss the excitement of the perfectly chosen word. I love words and I firmly believe there are no words that can capture the exact meaning the author struggles to convey, but I miss talking about how close the author came. There was a delight in being on retreat and the implicit notion that we had all the time in the world to discuss something not very important to most people. If I miss anything at all about my classroom, I miss the attempts to convey the beauty of language to students; I don’t think I often succeeded. As part of a small group I enjoyed the chance to write for a defined audience, and I was challenged to create examples of graphic art before I wrote. We each created three ‘soul cards’ or collages, and then attempted to write a short passage describing what was going on in our heads and hearts as we wrote. The results were rather surprising. Each of us had a story to tell, and each of instinctively knew how to put the three pieces into an order to make a coherent whole. While I enjoyed writing again, I enjoyed watching others discover their voices. It is always magical to watch people discover their own voices, especially those who think they ‘can’t write.’ I watched people courageously take on the challenge of writing about depression, or being a survivor of the sexual abuse crisis in the Catholic Church, or other traumatic and deeply meaningful times in their lives. The hardest part for me was not in writing down some of what I feel about myself and ministry. The most difficult thing was to give the words away. I normally only write for myself, and then never read anything I have written once I am done with it. In this instance I had to make sure the words had a chance to speak to the intended audience, but were also true to what I needed or wanted to say. Everything is is the hands of the editors now, and I am content to give those words away. If they are helpful to someone else all well and good. If they are not, it was not for lack of trying. The experience of trying to find the right words is what I will hold onto. In our culture it is common to ‘look back’ at the year just past and soon the inevitable ‘best of 2014’ lists will be out, or maybe they have already been published to spur on the financial madness we call the ‘Christmas shopping season’. In a deeper way, I want to take stock of the past year, but only as it helps to move forward. Yesterday was my “New Year’s Day”, the first Sunday in Advent, and so I pause to ponder the year past. The last time I posted was in April when I was beginning the Camino de Santiago. Because of technical difficulties I gave up blogging and communicated via email and Facebook with the ones who cared to keep up with the adventures of a quixotic middle-aged man from Nebraska. Many people have asked me to write about my adventures, and misadventures, but the experience was so profound I still cannot find the words. Someday…. I returned from Spain injured, and I was not supposed to walk or wear shoes for about two months. Nevertheless, I begged permission to ride my bicycle and I spent the summer exploring closer territory as unlike the Camino as anything I can imagine, but in the same spirit. As soon as I could I started walking and hiking again, I even hosted a family reunion of sorts at 10,000 feet up in the Rockies, and so life continued to be good. Although I was not looking for a job, the Nebraska Department of Education contacted me last spring and I began working for them in August. I had come to realize that I had not properly grieved the ending of my full-time teaching career, and it was an opportunity to work in education in a slightly different way. My cards say I am a ‘facilitator’ for a behavior program, but they call me a ‘coach’. Each time my boss refers to me as a ‘coach’ or talks about ‘coaching’ a smile comes to my lips as I think of the number of times I was asked to ‘not coach’ in various schools systems. Irony seems to be a close companion as I age…. And so, after the deepest, most profound experience of my life I am mostly doing things I did before the Camino. I substitute teach, and “coach” for the state, education is never far away. I minister a little less in my parish, and a little more for my diocese, and though it seems little enough, it is still the work I take the most pleasure in, and where I find the deepest meaning. I even had the opportunity to preach a short homily at a retreat to fellow ministers, and a couple of priests, and my comments referred mostly to how much we really know as compared to how much we think we know. I think it was well-received…. When I consider the past year this Advent, one person keeps coming to mind. I met a fellow pilgrim named Jim in Spain. Jim is an Episcopal priest, an intellectual, an amazing speaker, and a superb writer, I just read his latest posting this morning. Jim and I have stayed in touch although half a continent separates us. The older I get the more I believe that humility and gratitude are the only ways to appropriately approach life, and I am humbly grateful for the opportunity to meet, walk, and talk with Jim. If the Camino was the major event of the past year for me, meeting Jim was one of the many things that made it magical. I made it a habit on the Camino to never look back, the journey was before me. In just the same way, Advent reminds me the year is ahead of me. I am profoundly grateful for the year past, and it was a year of enormous change and adventure in my life. I have no great adventures planned for the new year, but life is adventure enough. Being a husband, father, teacher, ‘coach’, minister, grandfather and any other thing you might mention, is enough to “fill a man’s heart”, and although the context is different, Camus’ words come back to me, “one must imagine Sisyphus happy”. My Heart is Very Full….. I left England in rain and chill this morning and arrived in glorious sunshine and warm weather in St. Jean Pied de Port in the heart of French Basque country. Wild cherry trees with white blossoms are blooming on the mountainsides. I was filled with a profound sense of gratitude that brought tears to my eyes and I tried to hide them from our Formula I caliber driver. I walked around the medieval part of town and inflicted my terrible French on a very understanding cafe owner and bought some food for the high mountain leg tomorrow known as the Route Napoleon which is finally open and free of snow. My biggest challenge is trying to spend 46 euros worth of coins because I am not carry that extra five pounds on my back. Tonight I am happy, no, not happy, joyous. I am not sure why but I think it is knowing what a gift I have been given. Today was a wonderful day, and not all Camino days will be like that I am sure. Tomorrow is supposed to be one of the toughest stages. I will try to remember how I felt today because I know true joy is an elusive state of being. 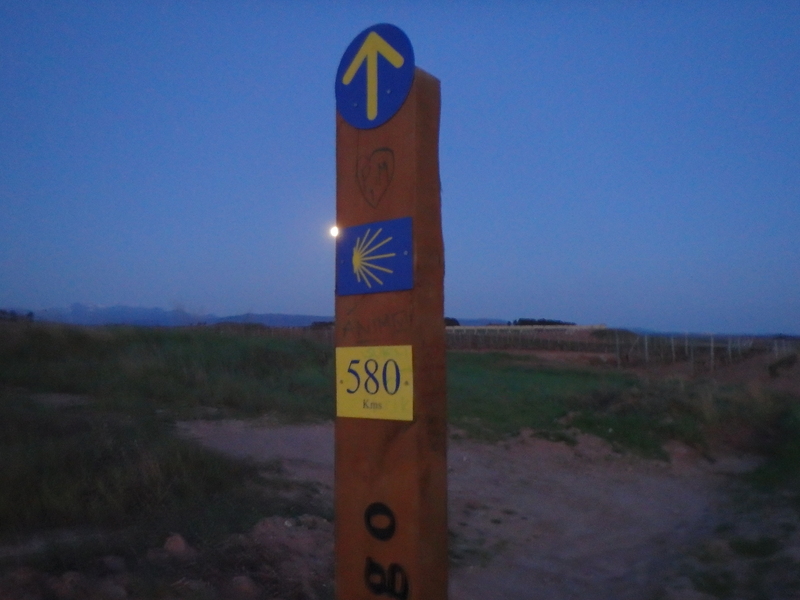 Camino de Santiago: A Magnificent Obsession…. Yes, I know I have written about the Camino before, and my longing to make an attempt. It is different now, it is real. Two weeks from today will be my first day on the Camino, and from everything I have heard and read, one of the toughest. My destination that day is at the end of a 15 mile walk and 3,000 ft climb, and right now the snow is described as ‘knee high’ at Roncevalles. 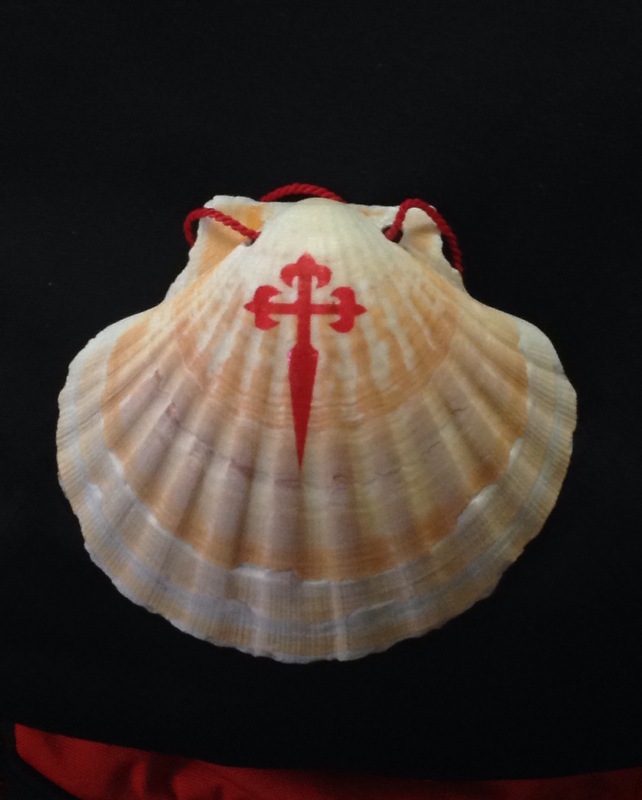 The symbol of the Camino de Santiago de Compostela. I have so read so much about the Camino over the years that all the stories, pictures, comments, and quotable lines run together in my memory. Somewhere I remember reading “you don’t know why you are doing the Camino until you are done, and then you can’t explain it.” I have had the similar experience of trying to describe what my Marine experience was like: civilians who have never done it can’t understand, and fellow veterans already know. Some things are becoming clearer to me. A former pastor asked me “why?” and the first thing that popped out of my mouth was “to listen” and he seemed satisfied with that answer. I thought about it, and it seems a good answer. Daily life, even retired daily life, is cluttered with little things to do, and a constant white noise that never seems to go away. A little time out might be in order. My current pastor gave an impassioned homily yesterday about how saying the rosary, or observing certain rites and rituals, or even going on pilgrimage (looking straight at me), were not the things that led to a good Christian life, and I quite agree. I am not doing this journey to become a better person, but perhaps to look at the person I see if I take a good, hard look. My motivations might seem a collection of paradoxes. I am not pushed to go because of my past or anything melodramatic. Rather I am called, and I have never felt so strong a call to action in my life. I am not running away, I am running ‘toward’. I have no idea of what I am running towards, and that is as it should be, or it wouldn’t be a journey of faith. 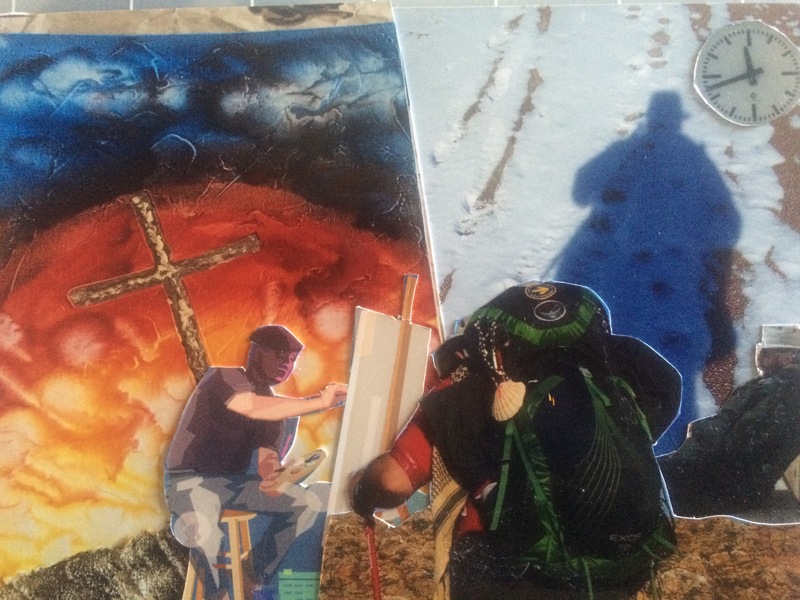 I communicate with pilgrims past and future, and they all describe the feeling as being called, so I am not alone. It is not ‘sensible’, and yet following the deepest longings of one’s heart seems eminently sensible to those who have done so. Perhaps the best paradox is that they say “the real pilgrimage begins, not ends, when one arrives in Santiago.” What that means is another thing I can’t explain.